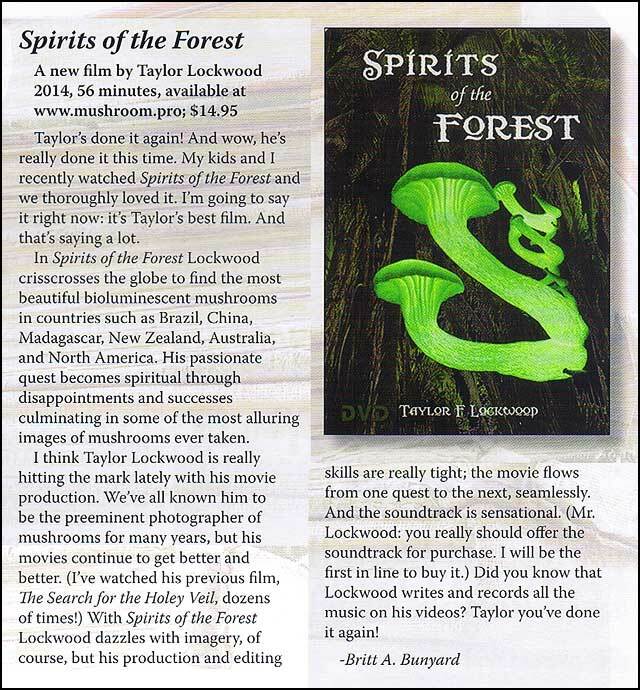 Click here to return to Spirits of the Forest page. Program length: approx. 56 min.
. . . the ending was great and the photos were spectacular! Nice job on the music, too. Seven of us just watched the (bioluminescent) DVD yesterday. Amazing night! Hey! We watched SPIRITS tonight in class- big hit. Thank you this is so beautiful! It is quite exquisite Thank You. Very impressive, Taylor. You are really seeing the world! And with such a great mission. You've done it again. Actually you've really really done it this time. Your new movie is really fantastic. You warned me. Definitely your best. Very nice, very tight production. And I really love the music.
. . . it was fanastic, well worth the wait. Thanks Taylor, for sharing your awesome video. I thoroughly enjoyed Spirits of the Forest. Great narration, quirky sense of humor, original music that made me want to get up and boogie, and of course, stunning mushroom footage. The shots of you riding a motorcycle into the jungle made me smile. We just watched the trailer and want you to know the violin set to the waterfall is our favorite piece!